Who are the Student Ambassadors? UIW Student Ambassadors assist the Office of Admissions in recruitment, retention, and orientation of new students. 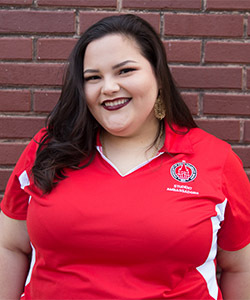 They foster a sense of community among students and visitors and act as official representatives of UIW. As Ambassadors, students gain valuable leadership skills, develop pride in the university, and meet new people. Think you have what it takes to be a student ambassador? Do you like to have fun and meet new people? Do you want to be involved on campus? Email our member's chair, Whitney Bell, for more information and an application. 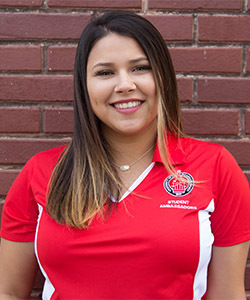 You can reach Whitney at wbell@student.uiwtx.edu. Do you have a question for our student ambassadors? 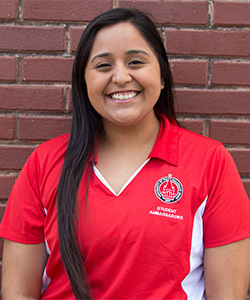 Ask our ambassadors about their experiences as students and leaders at UIW. 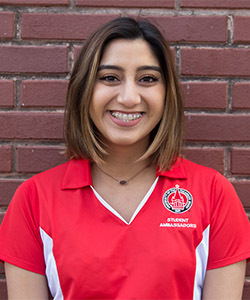 The Coordinator is responsible for the overall supervision, operation, and direction of the Student Ambassadors and serves as the official liaison for the organization with university administrators. Major: Kinesiology with a minor in Special Education. Advice for incoming students: "Be confident, get out of your comfort zone, and try new things!" Random Fact: "I play Sudoku about 5 times a day." The Co-Coordinator assists the Coordinator in monitoring and implementing duties and responsibility of Student Ambassador officers. The Membership Chair organizes the recruitment and retention activities of the organization, schedules interviews with potential members, and monitors participation of members. Major: Psychology with a minor in Sociology. Advice for incoming students: "Get involved and make UIW your home!" Random Fact: "I am part Cuban." The Membership Co-Chair assists the Membership Chair with all scheduling for the organization and monitoring member participation. Advice for incoming students: "Utilize your professor's office hours and establish a good student-teacher relationship!" Random Fact: "My favorite book from the Harry Potter series is The Order of the Phoenix. :)"
The Fundraising Chair plans and implements organizational fundraising ventures as well as securing community or university sponsorship as required by the organization. Major: Interdisciplinary Studies with Minors in Reading and Special Education. Advice for incoming students: "Investing in a planner and taking the time to plan and schedule your time is extremely beneficial to not only your state of mind, but your grades as well!" Random fact about me: "I love everything Disney, and I have a small collection of vintage items." 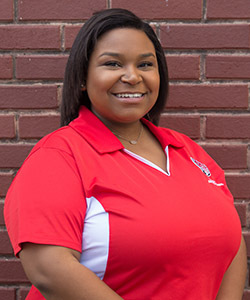 The Events Chair is responsible for working with the Campus Visit Coordinator to plan all Student Ambassador functions including Overnighter, Preview Day, Campus Visit Day, and Campus Tours. Advice for incoming students: "Make sure you're remembered for the right reasons. Get good grades, join as many organizations as you can, and never lose sight of your goals!" Random Fact: "I like giraffes!" The Public Relations Chair organizes public relations, advertising, and marketing for the organization. 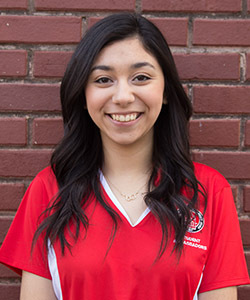 The PR Chair also monitors and contributes to social media accounts for the organization, keeps records of events and socials throughout the semester, and compiles a "Scrapbook" and a history of the UIW Student Ambassador Organization as well. Advice for incoming students: "Don't wait until 2:45 a.m. to do things." Random Fact: "It's 2:45 a.m."